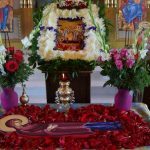 Albishara Orthodox Church celebrated the feast of the Dormition of the Most Holy Theotokos on August 28th. This feast marks the falling asleep (death) of the Virgin Mary, and the glorious events that followed. Click on each picture to enlarge.